A carpenter ant infestation can come out of nowhere, and unlike regular ants, they often cause significant damage to your home’s structure. Carpenter ants do not eat wood. However, they do like to nest in it. Damage occurs as they build their nest or add to their colony. If you are concerned about these little pests, the following tips will help you ward off an infestation. Carpenter ants and termites can both have wings. They look a lot alike, so it is often hard to determine what type of pest you are dealing with. Examine the body to figure out what you have. Carpenter ants are darker, with shorter wings, and are much more likely to be seen during the daytime. They also have a narrow waist, unlike termites. Clean well. 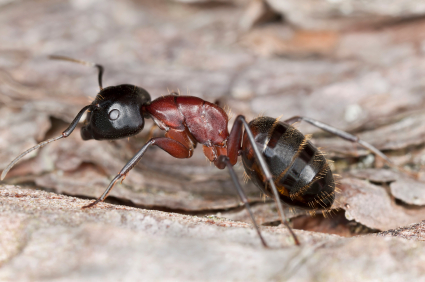 Carpenter ants are looking for a food source; if they can’t find one, they may simply move on. Soap and hot water is the best method for cleaning messes. Take out the trash regularly and always put food away so it is not left sitting out. Figure out what type of food the ants like so you can set traps for them. Leave out both protein and sugar and see what the carpenter ants prefer. Your traps will be more effective as a result. Look for the nest. Many people assume that the nest will be outside, but that is not always the case. Therefore, it is important to search both inside and out to find the colony’s base. Also, keep in mind that carpenter ants like to wander. This behavior is different from regular ants, which often follow a straight line as they walk back and forth from the nest. Therefore, you may not be able to simply follow their path to figure out where the nest is located. Instead, search around windowsills and baseboards. Look for little holes where the ants may be getting in and out. If your search is focused on the outside, remember that carpenter ants nest in wood. Therefore, look for logs or trees that may be housing the little creatures. If you have trouble, try baiting the ants. Doing so may help you find the nest, and it is also a good way to get rid of the ants. However, remember that baiting may not work forever. Ants are smart, and they may start avoiding a particular bait once they realize that it is hurting the colony. Still, if you are able to locate the nest, you can then use other methods to destroy it. The process of finding the nest may be frustrating, but remember that it is necessary for best results. If the ants are attacked at the nest, you are much more likely to get rid of them for good. 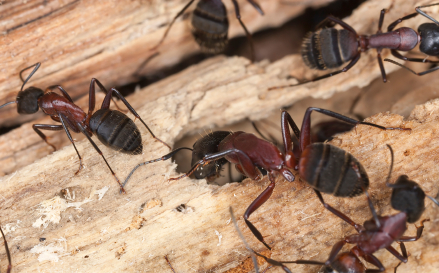 Carpenter ants are a problem that most homeowners would rather avoid. However, if you are suffering from an infestation, there are things you can do to help the situation. Use the tips above to try and get things under control. You can always call in a licensed pest control company if it becomes necessary.